Full-back Leighton Baines has apologised for critical comments made after Everton's defeat by Manchester United at Old Trafford on Sunday. Baines, 31, told the Liverpool Echo "there is no chemistry between the players" as the Toffees lost for the third straight league game. 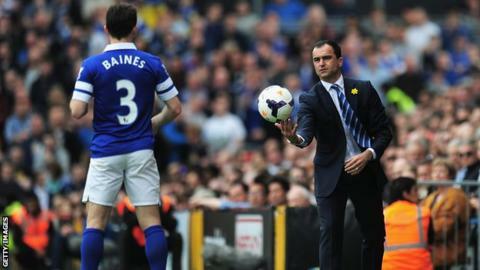 However, manager Roberto Martinez criticised the media for misinterpreting the remarks. "Clearly the words were taken out of context," said Martinez. Everton lie 12th in the league table, just one point above Watford in 14th and the two sides meet at Vicarage Road on Saturday. Martinez added: "They [the media] have been given the opportunity of maybe attracting a meaning that is not right, that is not correct and obviously for that he has apologised. "Someone with the experience of Leighton Baines, he has to take responsibility for those words. "We expect a senior figure at Everton to take responsibility, to make sure we speak on the pitch." Both Everton and Watford are into the semi-finals of the FA Cup and could meet in the final at Wembley on Saturday, 21 May.